It’s not unusual for the leafy grounds of the Château des Briottières to welcome classic car enthusiasts wanting to enjoy the authentic historic setting and the tranquil ambiance. 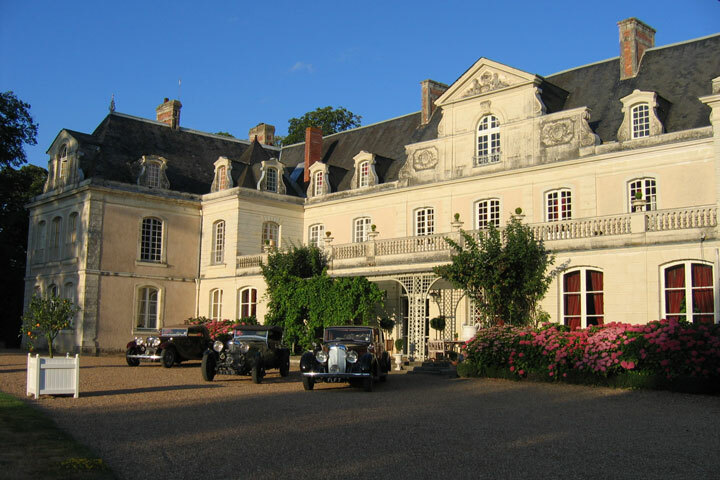 Ideal for a vintage-themed weekend, the Château des Briottières offers classic car enthusiasts the perfect setting. This prestigious family residence, now transformed into a four-star hotel, dates back to the 18th century and still retains its authenticity, while benefitting from its privileged location within the heart of the historic region of Anjou. Surrounding the château is a 50-hectare park, which offers guests a haven of tranquillity. One part of the vast grounds is laid out in the style of an English country garden and is able to play host to the most stunning vintage cars. Another part of the grounds is planted with trees, which is ideal for peaceful strolls. Equally relaxing is a dip in the outdoor pool. During the evening, after a delicious dinner in the 18th century dining room, you’ll be glad to relax in our luxury rooms, which are both comfortable and tastefully decorated. Situated just north of the city of Angers, the Château des Briottières is an excellent departure point for discovering the historic gems that the Pays de la Loire has to offer. Numerous clubs and groups of vintage car collectors have already used the château as a meeting point, but enthusiasts who want to enjoy a trip in their classic car are also welcome. The hosts of this prestigious hotel will be delighted to advise you on the best routes. Heading south is the must-see city of Angers, where the Château des Ducs d’Anjou proudly stands. This fortified 17th century monument now houses the Tenture de l’Apocalypse, a tapestry which measures several dozen metres in length. From the Briottières estate, a trip heading towards the Château de Chenonceau, also taking in the Château d’Azay-le-Rideau, promises to be yet another unforgettable day out. Don’t forget to take a detour via the town of Saumur, famous for its half-timbered houses, as well as its numerous châteaux and exceptional mansions, which offer superb panoramas. It’s not just here that offers inspiration for trips in a classic car. The whole of the Pays de la Loire region is known for its rich heritage worldwide. Share the post "The Château des Briottières and vintage cars: an enduring love story"